[He] was among the number of the first to administer to my necessities, while I was laboring in the commencement of the bringing forth of the work of the Lord, and of laying the foundation of the Church of Jesus Christ of Latter-day Saints. For fifteen years he has been faithful and true, and even-handed and exemplary, and virtuous and kind, never deviating to the right hand or to the left. Behold he is a righteous man, may God Almighty lengthen out the old man's days; and may his trembling, tortured, and broken body be renewed, and in the vigor of health turn upon him if it be Thy will, consistently, O God; and it shall be said of him, by the sons of Zion, while there is one of them remaining, that this was a faithful man in Israel; therefore his name shall never be forgotten. Joseph Knight, Sr., was born 3 November 1772 at Oakham, Worcester, Massachusetts. In 1809 he moved to Bainbridge, Chenango County, New York and two years later to Colesville, Broome County, New York where he remained for nineteen years. He owned a farm, a gristmill and carding machine, and according to his son, Newel, "was not rich, yet possessed enough of this world's goods to secure to himself and family the necessaries and comforts of life." His family consisted of three sons and four daughters. While Joseph Smith was living in Harmony, Pennsylvania he was occasionally employed by Joseph Knight. Such was the friendship that developed between these two men that the younger Joseph confided in his employer the circumstances of the coming forth of the Book of Mormon, and the elder sent provisions from time to time for the sustenance of his friend during the translation work. When Joseph Smith obtained the Book of Mormon plates in September 1827, Knight was visiting in the Smith home in Manchester. According to Lucy Smith, her son used Knight's horse and carriage as his means of conveyance on that occasion. 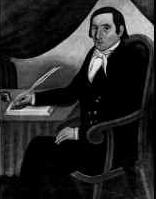 Although not numbered among those present at the organization of the Church in April 1830, Joseph Knight was baptized in June of that year. His family formed the nucleus of a small branch of the Church in Colesville, New York. In 1831 he moved with the Colesville Saints to Kirtland, Ohio, and a few months later continued with them to Independence, Missouri where he helped pioneer the Latter-day Saint settlement of that state. Joseph Knight died on 3 February 1847 at Mt. Pisgah, Iowa during the Mormon Exodus from Illinois. Joseph Knight's account reproduced below, although undated and unsigned, appears to be a holograph penned sometime between the author's departure from Jackson County, Missouri in 1833 and his death in 1847. Located in the Church Archives, the document is written in ink on both sides of five 8 x 10 inch pages. The manuscript is incomplete, missing at least one beginning page. Although written in pencil from one to ten, the page numbers were obviously added by a later writer to designate the sequence of surviving pages. A clerk's filing inscription on the document reads, "22 Sept. 1827. Manuscript of the early History of Joseph Smith finding of plates, &c. &c." The words "22 Sept. 1827," "early," and "finding of plates, &c. &c." were inserted by Thomas Bullock, a church clerk from 1843 to 1857. Minimal punctuation has been added here to facilitate reading]. From thence he went to the hill where he was informed the Record was and found no trouble for it appeard plain as tho he was acquainted with the place it was so plain in the vision that he had of the place. He went and found the place and opened it and found a plane Box. He oncovered it and found the Book and took it out and laid [it] Down By his side and thot he would Cover the place over again thinking there might be something else here. But he was told to take the Book and go right away. And after he had Covered the place he turned round to take the Book and it was not there and he was astonished that the Book was gone. He thot he would look in the place again and see if it had not got Back again. He had heard people tell of such things. And he opened the Box and Behold the Book was there. He took hold of it to take it out again and Behold he Could not stur the Book any more then he Could the mountin. He exclaimed "why Cant I stur this Book?" And he was answered, "you cant have it now." Joseph says, "when can I have it?" The answer was the 22nt Day of September next if you Bring the right person with you. Joseph says," who is the right Person?" The answer was "your oldest Brother." Joseph then went to Mr Stowels [Stowell] whare he had lived sometime Before. But Mr Stowel Could not pay him money for his work very well and he came to me perhaps in November and worked for me until about the time that he was Married, which I think was in February. And I paid him the money and I furnished him with a horse and Cutter to go and see his girl Down to Mr. Hails. And soon after this he was Married and Mr Stowel moved him and his wife to his fathers in Palmyra Ontario County. Nothing material took place untill toard fall the forepart of September. I went to Rochester on Buisness and returnd By Palmyra to be there about the 22nt of September. I was there several Days. I will say there [was] a man near By the name Samuel Lawrance. He was a Seear [Seer] and he had Bin to the hill and knew about the things in the hill and he was trying to obtain them. He [Joseph Smith] had talked with me and told me the Conversation he had with the personage which told him if he would Do right according to the will of God he mite obtain [the plate] the 22nt Day of September Next and if not he never would have them. Now Joseph was some affraid of him [Samuel Lawrence] that he mite be a trouble to him. He therefore sint his father up to Sams10 as he Called him near night to see if there was any signs of his going away that night. He told his father to stay till near Dark and if he saw any signs of his going you till if I find him there I will thrash the stumps with him. So the old man came a way and saw no thing like it. This is to shoe [show] the troubles he had from time to time to obtain the plates. So that night we all went to Bed and in the morning I got up and my Horse and Carriage was gone. But after a while he Came home and he turned out the Horse. All Come into the house to Brackfirst [breakfast]. But no thing said about where they had Bin. After Brackfirst Joseph Cald me into the other Room and he set his foot on the Bed and leaned his head on his hand and says, "Well I am Dissopinted. "Well," say I, "I am sorrey." "Well," says he, "I am grateley Dissopinted; it is ten times Better then I expected." Then he went on to tell the length and width and thickness I expected." Then he went on to tell the length and width and thickness of the plates, and said he, "they appear to be Gold." But he seamed to think more of the glasses or the urim and thummem then [than] he Did of the Plates, for, says he, "I can see anything; they are Marvelus. Now they are written in Caracters and I want them translated." Now he was Commanded not to let no [any] one see those things But a few for witness at a given time. Now it soon got about that Joseph Smith had found the plates and peopel Come in to see them But he told them that they Could not for he must not shoe [show] them. But many insisted and oferd money and Property to see them. But, for keeping them from the Peopel they persecuted and abused them [him] and they [the Smiths] ware obliged to hide them [the plates], and they hid them under a Brick harth in the west Room. About this time Came this Samuel Lawrance and one Beeman a grate Rodsman13 and wanted to talk with him. And he went into the west Room and they Proposed to go shares with him and tried every way to Bargain with him But Could not. Then Beeman took out his Rods and hild [held] them up and they pointed Dow[n] to the harth whare they ware hid. "There," says Beeman, "it is under that harth." So they had to garde the house until some time in November. He obtaind fifty Dollars in money and hired a man to move him and his wife to Pensylvany to hir Fathers, his wife Being onwell and wanted to go to her Fathers. He Bout [bought] a piece of Land of hir Father with a house and Barn on it. Here the People Began to tease him to see the Book and to offer him money and property and they Crouded so harde that he had to hide it in the Mountin. He now Began to be anxious to git them translated. He therefore with his wife Drew of[f] the Caricters exactley like the ancient and sent Martin Harris to see if he Could git them Translated. He went to Albeny and to Philadelpha and to new york and he found men that Could Translate some of the Carictors in all those places. Mitchel [Samuel L. Mitchill] and Anthony [Charles Anthon] of New York ware the most Larded [learned[ But there were some Caricters they could not well understand. Therefore Anthony told him that he thot if he had the original he culd translate it. And he rote a very good piece to Joseph and said if he would send the original he would translate it. But at Last Martin Harris told him that he Could not have the original for it was Commanded not to be shone. And he was mad and said what Does this mean, and he tore the paper that he wrote all to pieces and stampid it under his feet and says Bring me the original or I will not translate it. Mr. Harris, seeing he was in a passion, he said, "well I will go home and see, and if they can be had I will wright to you immeditely." So he Came home and told how it was and they went to him no more. Then was fulfild the 29th Chapter of Isiah. Now he [Joseph Smith] Bing [being] an unlearned man did not know what to Do. Then the Lord gave him Power to Translate himself. Then ware the Larned men Confounded, for he, By the means he found with the plates, he Could translate those Caricters Better than the Larned. Now the way he translated was he put the urim and thummim into his hat and Darkned his Eyes than he would take a sentance and it would apper in Brite Roman Letters. Then he would tell the writer and he would write it. Then that would go away the next sentance would Come and so on. But if it was not Spelt rite it would not go away till it was rite, so we see it was marvelous. Thus was the hol [whole] translated.Now when he Began to translate he was poor and was put to it for provisions and had no one to write a little for him through the winter. The Next Spring Oliver Cowdry a young man from palmyra Came to see old Mr Smith, Josephs father, about this work and he sent him Down to pensylveny to see Joseph and satisfy him self. So he Came Down and was soon Convinced of the truth of the work. The next Spring Came Martin Harris Down to pennsylvany to write for him and he wrote 116 pages of the first part of the Book of Mormon. And about this time Martin wanted to go home a Bout some Buisness and he wanted to take the writings with him But Joseph put him of[f]. But he urged him By fair promises that he would be Careful and he would Return it again. But he Being free with it some person go[t] hold of it and Cept [kept] it so that he never Could obtain it again. There fore Joseph Lost his privilige for a while. But after Repenting he again received the privelage of translating again, as in Book of Covenants page 163. Now he Could not translate But little Being poor and nobody to write for him But his wife and she Could not do much and take Care of her house and he Being poor and no means to live But work. His wifes father and familey ware all against him and would not j[e]lp him. He and his wife Came up to see me the first of the winter 1828 and told me his Case. But I was not in easy Circumstances and I did not know what it mite amount to and my wife and familey all against me about helping him. But I let him have some little provisions and some few things out of the Store a pair of shoes and three Dollars in money to help him a litle. In January his father and Samuel [Smith] came from Manchester to my house when I was Buisey a Drawing Lumber. I told him they had traviled far enough. I would go with my sley and take them down to morrow. I went Down and found them well and the[y] were glad to see us. We conversed about many things. In the morning I gave the old man a half a Dollar and Joseph a little money to Buoy paper to translate, I having But little with me. The old gentlemen told me to Come and see him once in a while as I could I went home followed teaming till the last of March the slaying [sleighing] Being good. I told my wife I must go Dow[n] and see Joseph again. "Why Do you go soon, for," said she. Says I, "Come go and see." And she went with me. Next morning we went Down and found them well and ware glad to see us. Joseph talked with us about his translating and some Revelation he had Received and from that time my wife began to Beleve and Continuwed a full Believer untill she Died and that was the 7 Day of August 1831. In the spring of 1829 Oliver Cowdry a young man from Palmry went to see old Mr. Smith about the Book that Joseph had found. And he told him about it and advised him to go Down to Pensylvany and see for him self and to write for Joseph. He went Down and Received a Revelation Concerning the work and he was Convinced of the truth of the work and he agreed to write for him till it was Done. How Joseph and Oliver Came up to see me if I Could help him to some provisons, [they] having no way to Buy any. But I was to Cattskill. But when I came home my folks told me what Joseph wanted. But I had ingaged to go to Catskill again the next Day and I went again and I Bought a Barral of Mackrel and some lined paper for writing. And when I came home I Bought some nine or ten Bushels of grain and five or six Bushels taters [potatoes] and a pound of tea, and I went Down to see him and they ware in want. Joseph and Oliver ware gone to see if they Could find a place to work for provisions, But found none. They returned home and found me there with provisions, and they ware glad for they ware out. Their familey Consisted of four, Joseph and wife, Oliver and his [Joseph's] Brother Samuel. Then they went to work and had provisions enough to Last till the translation was Done. Then he agreed with Martin Harris to print. They therefore agreed with E. Grandin to Print five thousand Coppies which was Printed and Bound at Palmiry in the Spring of 1830. Now in the Spring of 1830 I went with my Team and took Joseph out to Manchester to his Father. When we was on our way he told me that there must be a Church formed But did not tell when. Now when we got hear to his fathers we saw a man some Eighty Rods Before us run acros the street with a Bundle in his hand. "there," says Joseph, "There is Martin going a Cros the road with some thing in his hand." Says I, "how Could you know himi so far? Says he, "I Believe it is him," and when we Came up it was Martin with a Bunch of morman Books. He Came to us and after Compliments he says, "The Books will not sell for no Body wants them. Joseph says, "I think they will sell well." Says he, "I want a Commandment." "Why," says Joseph, "fullfill what you have got." "But," says he, "I must have a Commandment." Joseph put him off. But he insisted three or four times he must have a Commandment. We went home to his fathers and Martin with us. Martin stayed at his Fathers and slept in a Bed on the flor with me. Martin awoke me in the nite and asked me if I felt any thing on the Bed. I told him no. Says I, "Did you?" "Yes, I felt some thing as Big as a grat Dog Sprang upon my Brest." Says I, "Was you not mistekened." "No," says he. "It was so." I Sprang up and felt, But I Could see nor feal nothing. In the morning he got up and said he must have a Commandment to Joseph and went home. And along in the after part of the Day Joseph and Oliver Received a Commandmant which is in Book of Covenants Page 174.20 I stayd a few Days wating for some Books to Be Bound. Joseph said there must Be a Church Biltup. I had Ben there several Days. Old Mr Smith and Martin Harris Come forrod [forward] to Be Babtise[d] for the first. They found a place in a lot a small Stream ran thro and they ware Babtized in the Evening Because of Persecution. They went forward and was Babtized Being the first I saw Babtized in the new and everlasting Covenant. I had some thots to go forrod, But I had not re[a]d the Book of Mormon and I wanted to oxeman [examine] a little more I being a Restorationar and had not oxamined so much as I wanted to. But I should a felt Better if I had a gone forward. But I went home and was Babtised in June with my wife and familey. There was one thing I will mention that evening that old Brother Smith and Martin Harris was Babtised. Joseph was fild with Spirrit to a grate Degree to see his Father and Mr Harris that he had Bin with so much he Bast [burst?] out with greaf and Joy and seamed as tho the world Could not hold him. He went out into the Lot and appeard to want to git out of side of every Body and would sob and Crie and seamed to Be so full that he could not live. Oliver and I went after him and Came to him and after a while he Came in. But he was the most wrot upon that I ever saw any man. But his joy seemed to Be full. I think he saw the grate work he had Begun and was Desirus to Carry it out. On the sixth Day of April 1830 he Begun the Church with six members and received the following Revelation Book of Covenants Page 177. They all kneeld down and prayed and Joseph gave them instructions how to Bild up the Church and exorted them to Be faithfull in all things for this is the work of God. Now after he had set things in order and got a number of Mormon Books we Returned home. Then in June as I Before said I and my familey and a number more ware Babtised, Joseph Being present and Confirmed them. And through that season there ware many Babtised in Many places and the Church grew and multiplied. But soon after the Church Began to gro the People Began to Be angry and to persecute and Cald them fools and said they ware Decived. But along toards fall Joseph and Oliver Cowdray and David Whitmore [Whitmer] and John Whitmore Came from Harmony in Pennsylvany to my house on some Buisness. And some of the Vagabonds found they ware there and they made a Catspaw of a young fellow By the name of Docter Benton in Chenengo County to sware out a warrent against Joseph for as they said pertending to see under ground. A little Clause they found in the york Laws against such things. The oficer Came to my house near knite [night] and took him. I harnesed my horses and we all went up to the villige But it was so late they Could not try him that nite and it was put of[f] till morning. I asked Joseph if [he] wanted Counsell he said he thot he should. I went that nite and saw Mr James Davison [Davidson] a man I was acquainted with. The next morning the gatherd a multitude of people that ware against him. Mr Davison said it looked like a squaley [squally] Day; he thot we had Better have John Read [Reid] a prety good speaker near by. I told him we would, so I imployed them Both. So after a trial all Day jest at nite he was Dismissed. Then there was another oficer was Ridy [ready] and took him on the same Case Down to Broom County Below forth with. I hired Boath these Lawyers and took them Down home with me that nite. The next Day it Continued all Day till midnite. But they Could find no thing against him therefore he was Dismist.Soon after this Joseph Left the Susquhannah river and went to Manchester to his Fathers. Then about the first thing Sidney Rigdin came from ohio to see Joseph and they Boath Came Down to Broom County and Joseph and Sidney went Down to Harmoney to settle some Buisness. And the Mob found they ware gone and they found when they ware expected Back and we found they had a plan laid to take Joseph and Sidney and me. Now Sidney had Ben at my house several Days and had preached there several times and he was too smart for them therefore they wanted to trouble him. And the Day we expected them I sent my son Down to meat them and told them of their Plan and they turned acrost to Chenango point. And so went to the Lakes. And I Loaded up what I Could Cary and went away that nite for the Lakes. I also took my wife and Daughter for we war[e] calcalating to go soon for we a litle Before had a revelation to go to ohio. So the Mob watched all nite at the Bridge. But Behold we all Came up missing and the poor mob Lost all their truble. Now Joseph and I went rite on to Kirtland ohio But did not stay long there for in March we went to the town of Thompson a bout twenty miles and in the spring the Colesvill Church all Came on. But Joseph remaind in Kirtland and Sidney soon Came to Kirtland. Now this Spring Joseph received anumber of Revelation. One was to purchase a thousand acres of Land which was Claimed by Leman Copley and not paid for. He had a little Before Come into the Church and apeard to Be Zelaus and faithful. We all went to work and made fence and planted and sowed the fields. About this time we ware Cald upon to Consecrate our properties. But Brother Copley would not Consecrate his property therefore he was Cut of[f] from the Church. Then we was Commanded to take up our Jorney to the Regions westward to the Boarders of the Lamanites. And we sold out what we Could But Copley took the advantege of us and we Could not git any thing for what we had done. So we left Copleys in June and moved our things to wellsvill on the ohio river which was about ninety miles. Then we went on Board the Steamer the third Day of July and we landed in uper Misouria the 26th of the same Month. We found our selves among strangers But the people seamed to Be frindley with us. And we found the Country to be Butiful rich and plesent and we made our selves as Comfortable as we Could. And in a few Day Joseph and Sidney and a number of Brotherin came and they looked out and Enterd a Considrible of Land, for the People to Settle on. We found it a new Country with some settlrs on it. There was one Joshua Lewis that had Come into the Church the winter Before, he and his wife. And they ware faithful and good to us and took us in to their house, my wife Being sick as before stated. She Died the Seventh Day of August and Joseph and Sidney attended her funeral on the Eighth. She was Burried in the woods a spot Chosen out By our selves. I was along By where she was Buried a few Days after and I found the hogs had Began to root whare she was Buried. I being verry unwell But I took my ax the nex Day and went and Bilt a pen round it. It was the Last I done for her. Joseph at this time Looked out the Country and found the place for the City and Temple and set Mark, and after giving all other nesesary instructions he Returned Back for Kirtland. But as time Came along we often heard form him and Recevied Revelation. The next year in 1832 he Came again to Missouri28 and set things in order and Cald the Colesvill Church to gather and seald them up to Eternal Life. And this made some little feeling among others But I think he [k]new Best. So that passed of[f] and he Returned to Kirtland again and I think he Did not Come to Missouri the next year for the Mob Began to sho their Black heads in 1833. But Joseph Sent and Counsled During our troubles in Jackson County and after the worst Came to the worst thot we had Better leve the County.